Theremin World - The RCA Theremin Registry Turns 16! I started the RCA Theremin Registry on April 14, 1996 with the goal of answering one question: Of the ~500 or so originally built, how many RCA theremins still exist? It was a simple goal, fueled admittedly by dreams of randomly walking into an antique store and finding one for sale for a hundred dollars, taking it home, and finding it was in perfect working condition. I still have that dream fairly regularly (Come on... admit it. You do too, right? 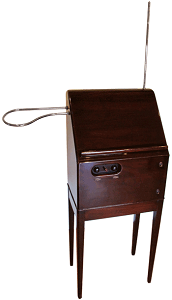 ), but since then, the RCA Theremin Registry has evolved into so much more! In the early days of the website (formerly The Theremin Home Page) and the registry, I was regularly treated to emails and letters from the Ether including color photos of RCAs and detailed recollections from childhood days of playing the instrument at an aunt or uncle's house, discovering one in the basement and figuring out it wasn't some kind of crazy radio, or even finding one at a garage sale for a mere $75 (there's that dream again!). I've kept each and every one of those letters and photos in my archives. With a busy family and work life, I wasn't able to keep up with the mission of the registry. But luckily, the highly motivated and qualified duo of Andrew Baron and Mike Buffington have taken the torch and are carrying the mission forward. The registry is now hosted at their site, RCATheremin.com. Starting with our list, they've cataloged 96 RCA Model AR-1264 theremins as well as several other original instruments built by Leon Theremin himself. I'm very excited with the level of energy they're putting into the registry and hope they're able to track down the remaining instruments. If you haven't been by lately, check it out and send them a thanks for continuing this fantastic treasure hunt!